So, yesterday kinda sucked for us Match-heads. If you haven’t seen the news, there is a little tiny snippet in an article on CBR. Click here to read the entire article. The Fury of Firestorm: The Nuclear Man #20, shipping in May, will be the final issue of the series. Click here to read Dan Jurgens response to the cancellation. The cancellation of The Fury of Firestorm: The Nuclear Man wasn’t terribly surprising as we’ve all heard about the low sales. 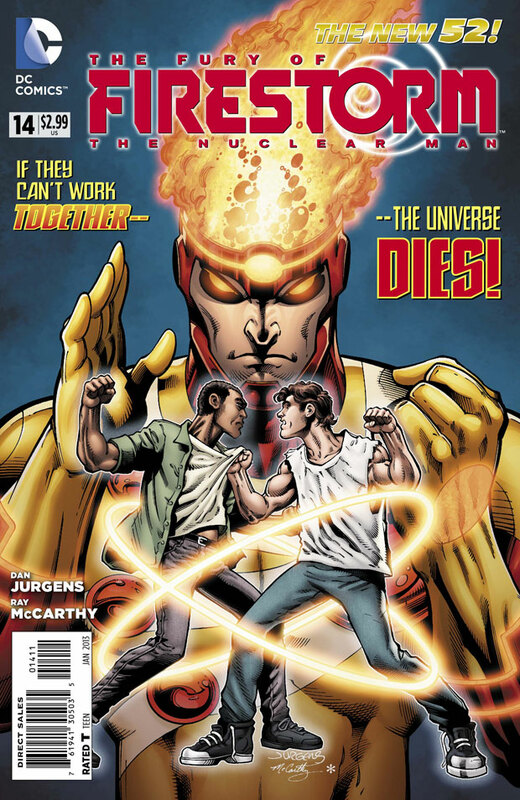 However, I personally find this cancellation disappointing because the past four issues of Firestorm by Dan Jurgens, Ray McCarthy, and Hi-Fi have been a breath of fresh air, both for the character and for superhero comics in general. My thanks for all the kind messages I received on Thursday. You guys are amazingly supportive of the character and me personally. I truly appreciate it. Hopefully Firestorm will continue with the Justice League so we can get our monthly fix of ole Match-head. Not surprisingly, I’m feeling pretty down right now. I’ll see if I can muster some positive spirits within the next few days. In the meantime, be sure to submit you entry for the “What Do You Like About Firestorm” contest! Given the dark cloud over the Nuclear Man’s future right now, this contest is even more important! Enter today and you might win a prize! ← Contest: What do you like about Firestorm? I’m right there with you, Shag. My favorite DC book, and one of only three I was collecting for a long, long time. It’s only been the last few months since I started the Burrow that I started adding more DC books to the pull list. I feel bad for Luke, too, what with Hawkman also getting the heave-ho. And I just added Hawkman to the pull list. Damn! Not understanding DC’s backwards way of thinking right now. They just added both Firestorm and hawkman to the Justice League books. Now the way they are looking at it is “Well, we’re putting these characters into top-selling titles, so let’s get rid of their low-selling solo titles”. What they SHOULD be doing is giving the solo titles a few months to see if their sales AFTER they’ve been in the JLA books for a while. But nothing DC does surprises me anymore. It’s why I’m a Marvel guy first and foremost. I haven’t had to deal with as many cancellations of books I enjoy over on the Marvel side of the pond, and when I did, they restarted the series with a new #1 shortly after. DC’s big problem right now is the whole “New 52″ concept. The are limiting themselves by only allowing 52 series at once. So everytime a new idea for a series comes along, they have to get cancel-happy. Firestorm didn’t desrve to be cancelled. It was selling close to 15000 copies a month, (if I have my facts straight). Isn’t 20000 considered good in this day and age? I don’t know. At least we have him in Justice League to look forward to. Hopefully he’ll get a fair amount of screen time. Wow, that is full of all kinds of typos. Have to stop typing at 5:30 in the morning. Well Shag, looks like karma is in fact a wench. All of my joking about Hawkman outlasting Firestorm, and they end at the same time. Ah well. Sad to see more creative titles like Firestorm and Sword of Sorcery ending so that we can most likely get even more Batman titles. DC, please drop any and all pretense and change your name to “DC Batman Comics” and do what you have always wanted — put out nothing but Batman comics every month. The sad truth is, the titles that initially struggled after debuting with the New 52 launch were never going to gain that ground back without a serious push from publisher. I think GREEN ARROW came out of the gate even sloppier and mismanaged than FURY OF FIRESTORM, but the Emerald Archer has had near-constant buzz because of the TV show running parallel, and they finally decided to really push the monthly series by putting Jeff Lemire, one of DC’s new golden boys, on the book. Firestorm needed more than Dan Jurgens to keep his series going–no disrespect intended to Mr. Jurgens–it needed incentive. As the man himself said, the book never got real support or advertising from the publisher after he took over. What DC should have done to bring in new readers, or lapsed readers, was release issue #13 for ninety-nine cents and hyped the discount to retailers and customers in the direct and digital markets. For a mere dollar, readers who didn’t know about the character or who maybe felt disappointed by the first issue, could have given it a second chance without sacrificing anything. If the quality storytelling is there, they would come back. This kind of promotion has worked in the past. In the early 2000’s, Marvel released the first issue of Mark Waid and Mike Wieringo’s run on FANTASTIC FOUR for twenty-five cents. I had never read a FF book before that and never thought I would, but I gave it a shot because it only cost me a quarter. To this day, that is my favorite comic of all time, and it led me to follow what I consider one of the greatest runs on a series ever. I’m not sad to see any of the other books that were cancelled go; Hawkman’s one of my favorite characters, but I think that title needed to be put down like a wounded animal so that it can be rebooted or rejuvenated at a later time. But FURY OF FIRESTORM was discovering a lively new creative direction. It just needed help from Marketing to find its sales direction. Tough break, Shag. We’ll keep fanning the flame until Firestorm flies again. I just hate how they say Firestorm was plagued with too many creative changes. Ethan Van Sciver was there for 10 or 11 issues and Yildiray Cinar was on the book for 11 or 12. Joe Harris and Gail Simone were each there for 6 months. In this day and age I don’t consider that too many creative changes. Especially when Green Arrow has gone through 4 different writers and even Superman has had 3 or 4 different creative teams since it started. I’d say Firestorm has been pretty steady. I’m as well sad by this news. But here’s a initiative: Let’s celebrate when #20 hit the shelves. Maybe we won’t be able to gather around in a same place, but do something special maybe tweeting, posting on Facebook, G+ or even Tumblr, not only showing our support for Firestorm, but as well to Dan Jurgens, which I believe most of the match-heads have been celebrating every single issue he has done. Let’s show DC, that indeed the book was plagued with creative shifts but fans were supportive 100%. And who knows, maybe in a not long future Firestorm will have his own solo book again. DC has announced some new New 52 books, two politically themed titles — a revival of The Green Team (the s-called “1%”) and a new title called The Movement (the so-called “99%”). Beyond the fact that you have already limited your audience to both of these titles by advertising them as such, this is what DC thinks will sell? The Green Team had -1- story published before they were canned. The Movement sounds like a lot of leftist gibberings. Both books have good creative teams, but so what? WHO CARES? I love the concept of the classic Green Team but I’m not going to throw good money away on a book that WILL be cancelled within month of it’s debut. I’m not that much of a masochist — I may be a Hawkfan but I’m not an idiot. I’m serious when I say that at some point DC will become 75% Batman comics and a few token hangers-on in the form of Superman, Wonder Woman, the Justice League etc. I loved that the New 52, when it launched, approached all sides of the DCU and of DC Comics in general. We’ve slowly whittled that away and added more and more Batman related books because that is the only thing they know how to sell. And you know, I have been a big backer of DC after being a life-long Marvel guy, ever since the Avengers Disassembled story ended the Marvel Universe I knew. I moved almost entirely to the DC side of the superhero fence. I learned so much about the DCU that I never knew in this past 9 years or so that it is downright shocking. So as Marvel became continually “more of the same,” “more of the same,” “more of the same,” I gravitated more to DC. Read titles I had never read before. Followed characters I was only vaguely familiar with. Had a heck of a lot of fun. I mean, the only Marvel title I read is Iron Man, only recently joined by Morbius. I loved the New 52. You can go back and look at all of my praise for the concept and the launch. So this trend towards “more of the same” over at DC is very disheartening. But that’s okay. Every dollar DC doesn’t get of my money on comics can go to smaller press books, or GI Joes, or Hot Wheels cars, or Magic cards, or Ultra-Acts and SH Figuarts & SH Monsterarts. Their loss. Maybe a little silver lining — looks like Firestorm is in the same month’s Justice League issue, Justice League #20. I have nothing but contempt for this series, especially towards Gail Simon, Ethan Van Sciver, and (especially) Dan Didio. I’m sorry that this series had to go, but i honestly believe it was in the best interest for the long haul that it was. If we’re blessed w/ another go-around w/ Firestorm, maybe we’ll have someone whom can pick up the pieces and give us the series we demanded and were promised after Brightest Day. (Even if its Jurgens again). I left this book after #1 because it really didn’t feel like “Firestorm” to me. I came back when Dan Jurgens took over and loved it. Real shame about the cancellation. Firestorm is on the cover of Justice League #20, helping the “Big Guns” battle Despero no less, so hopefully he’ll be a full-time member there now. I know DC will never do this, because “anthologies don’t sell” blahx3, but I’d love to see a JLA-branded 80 page giant monthly starring Firestorm, Hawkman, Atom, and whatever classic JLers don’t have regular features. That way the book isn’t reliant on any one character to carry it, and you can keep bringing the JL in for crossovers to help spur sales. Tales from the Watchtower? Justice League:New 52, something like that. Firstly Shagg, im sorry about the bad news. It’s been a crap start to the year, first they cancelled the Young Justice tie-in comic, then the animated series, and now firestorm.
. . . at least you’ll be able to replace it in your budget with Vibe. Short of having Ronnie fuse with Bruce Wayne and having the bat-signal project from the fiery top of Batstorm’s flaming cowl, I don’t think DC will save this book, unfortunately. Mad. Angry. Upset. Those words just dont describe how I’m feeling today. It just doesn’t make sense. How can you take a great character and not make him work? You had a great creative team and the protocols was the best they could come up with? I hated that storyline and I only supported the book because I love… LOVE the character of Firestorm. I hoped he would be brought back to something resembling the classic take one day. We finally got it but the damage was already done. Im sure we all knew that. And I love Jurgens dont get me wrong, but NOT giving the Rogues their shot right away was a mistake. Hell, it may not have made a difference. Editorial may have already known Firestorms days were numbered. We’ll never know for sure. Firestorm is what keeps me in comics. I got out of comics for many many years after Ronnie was killed. Now I feel the same once again. If there isnt a Firestorm book to be had I really dont care to read anything. Ive already cut my pull list in half after hearing this terrible news this morning. I will keep the JLA books in the hopes he will show up there. Animal man and Suicide Squad will be saved cause they have always been faves of mine. Thats it. DC may have cancelled Firestorm, but they’ve lost me buying 6 titles that just got axed. I will continue to LOVE Firestorm. I hope he gets back to us very very soon (with someone helming the title who loves and understands what Firestorm is really all about). Now that’s what I call an epitaph. So, does the cancellation affect the status of the beloved Fire and Water Podcast? Nuclear Subs everywhere want to know! Will it affect the show? Sure–we’ll no longer have FoF to cover every month, but there’s still tons of Firestorm stuff to cover, plus he’ll be in JL from now on. We didn’t intend to keep covering JL past ToA, but if Firestorm AND Aquaman are in the book I think we’ll have to. I want to keep doing the show as long as Shag does. And probably even a little past that. Shame but not surprising. In another reality not so far away Firestorm would have carried on from Brightest Day in the same was Aquaman did, as with Aquaman Brightest Day set him up as an A-lister thanks to Geoff Johns’ support and good work and while you can argue the difficulty of selling books like Firestorm and Hawkman in todays market I can just point you to the success of Aquaman and even the similar success of Johns & Jurgens booster Gold series -lasting nearly 50 issues before Flashpoint brought it to an understandable end! THAT could have been Firestorm. Or even Hawkman. Instead we got what we got and Firestorm remains a solid B-lister at best because of it… fingers crossed though that Geoff Johns can keep him in the trenches with his upcoming Justice League appearances! I got back into comics because Captain Atom got a new series. I stuck with DC because YOU got me into Firestorm. I’ve always been a DC guy but now… I’m more into what Marvel is doing. I think the only DC book I’ll stick with is Green Lantern. Dark days for DC. I dunno. Maybe I’ll see what that fish guy is up to. Its a longshot, but im trying to be optimistic! Overall, I am happy right now to say we had 20 issues of Firestorm. yeah, things could always be better, but at least he did get some coverage right at the start of the New 52. Firestorm is such a great character from design to powers to history. You can’t keep him down but for so long and I am happy he is going to be in another book. One day, Rob and Shag, one day, even if I have to pay for it myself, we will have the Fire & Water Podcast Issue Maxi-Series to ongoing starring Aquaman and Firestorm. Or at the very least maybe DC can throw us a bone and get some interaction from these two! My internet has been down all weekend, I finally get it back to discover that FIRESTORM was cancelled? Yeesh. Sorry, Shag. We all know that Firestorm is such a good character, even death couldn’t keep him down. It’s a pity that FLUSHPOINT robbed us of the opportunity to better capitalize on the momentum granted the character by BRIGHTEST DAY. (The same could be said for JLI. Sigh.) Fortunately for all of us, Firestorm will live to headline a book another day. Sigh. I know I’m behind the curve here. No, in fact, I read this a while ago, but got depressed about it. Firestorm is a good/strong character. Firestorm has a strong, loyal fan base. Firestorm won’t beat Batman in sales, Superman in sales, etc… However, he does have a loyal following that will support him. DC, however, seems to kill any momentum Firestorm has going for him. DC also won’t him in their new animated series(es). DC has inconsistent story-lines with Firestorm. Story-lines without focus, direction, vision. However, despite DC decisions, there have been successes along the way, and I’m certain Firestorm Fans (and FirestormFan.com) will continue to fan the flame.